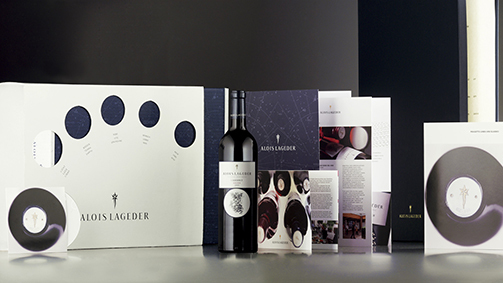 Interview with Alois Lageder: the art of wine from SGA Wine design on Vimeo. Alois Lageder took over the company, which dates back to 1823, in the mid-60’s. With the help of his sister Wendelgard and brother-in-law Luis con Dellemann, he immediately moved to give a new face to the historic company and secure a new position in the market. Convinced that his land had potential that was as yet largely unappreciated, he opted for the route of quality, purchasing new plots and focusing on innovative methods both out on the vineyard and in the cellars. This lead to the birth of products like the uvaggio rosso Cor Römigberg or the Löwengang Chardonnay, which signified a real change of style in the company’s panorama. 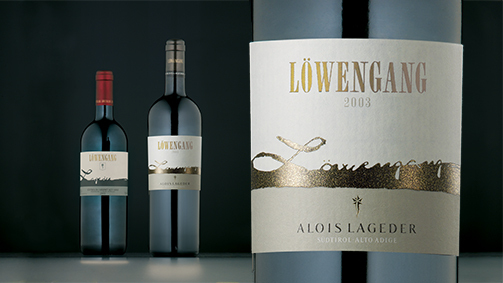 Alois Lageder purchased the Hirschprunn estate in 1991, (30 hectares of vineyards surrounding the renaissance building), which was added to the Löwengang estate in Magrè, in the southernmost part of the province. It is an estate with excellent vines in the perfect position to produce great full-bodied red and white wines like Cabernet and Merlot. In 1995 in Magrè, Alois Lageder constructed a new cellar, a shining example of modernity with its sustainable and ecological architecture. Since the early nineties, the company has been pursuing an innovative project, gradually converting its vineyards to dynamic-biological cultivation. Faithful to the holistic approach that characterises his business philosophy, with the help of his wife Veronika Riz, theatrical dance choreographer, and their three children, Alois Lageder promotes initiatives connected to contemporary art and music within the company. 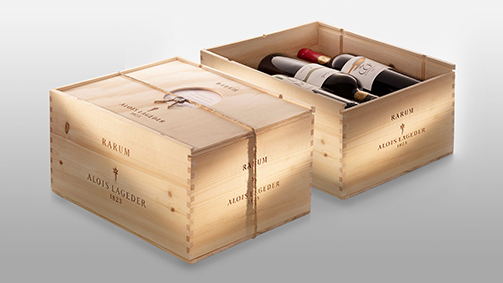 150 years deeply rooted in its territory, Alois Lageder is a company that unites tradition and innovation. Use of the most advanced technology and respect for sustainability; production and preservation of the environment: what’s the secret to addressing such radically different demands? Perhaps at first glance they appear very different aspects, but that’s not the case. My experience has taught me that the more we have evolved, the more we’ve been moving in the wrong directions. Therefore, today, innovating often means returning to the past. For 10,000 years man has cultivated the land using methods in tune with nature; in the last 150 years, on the other hand, with industrialisation and rationalisation of work, in my opinion we have taken a wrong turn. Biodynamics teaches us to go back to the roots, to find a bond with nature and follow in the footsteps of our ancestors, even if it is with a different and more efficient approach. In our case, we have tried to respect our traditions, but without remaining in the past. We take the past as a starting point we can evolve from. In fact the Alois Lageder brand is now synonymous with biodynamic wine production and the holistic and sustainable approach: how are these values communicated to the consumer? In recent years we have tried to communicate our experience in the world of biodynamics through on-site activities and via the packaging of our bottles. We decided to associate ourselves with one of the institutions that follow biodynamics, Demeter, which has been operating since 1928, that is just four years after Rudolf Steiner’s lessons on biodynamic agriculture. Due to the importance we attribute to transparency, we decided to show this brand clearly on the label: since “bio” became fashionable (and many producers began claiming to be bio that aren’t), I’m convinced that we need to give the consumer a guarantee, informing them of the work and serious control processed behind this certification. Sustainability is just as complex but it’s more difficult to communicate: for this reason we have always tried to bring potential customers to our vineyard, so they can experience our production process first hand. Bioarchitecture: the cellar within the historic Löwengang estate also encompasses the dual philosophy of environmental protection and efficient production. What principals inspire its design? The first design of the cellar, which dates back to ’92, didn’t focus much on sustainability, as more than twenty years ago it wasn’t such an issue. However, at that time, for other reasons, I met the founder of the Eco institute of Alto Adige, whom I spoke with about the idea of constructing a new cellar: it was he who encouraged me to integrate features to make it sustainable. So that’s why I put aside the first project and started a second from scratch: the basic idea was that our company had the responsibility and obligation to leave a world for future generations that we have preserved with our own resources. The project was built around three conceptual pillars, first of all it had to use a minimal amount of energy. Instead of using fossil fuels to produce heat we designed it to be powered by renewable sources (water, sun and biothermal). The second objective was to create an attractive and healthy environment for everybody working in the cellar, but also for the wine, which is extremely sensitive to external factors. We therefore eliminated possible sources of electro-smog, opting for sustainable architecture and the use of natural convection to air the environments. The third ambition of the project, and perhaps the most important, was to ensure the grapes are processed gently and smoothly. With this in mind, we constructed a round vinification tower, 17 meters deep, into which the grapes are loaded at the highest point; as they drop down they travel through the various processing phases without any mechanical movements. This is how we maintain all the quality of the vine. In a cellar, one can’t create quality from nothing: all we can do it treat the grapes delicately and refine the wine to preserve the quality. With this same idea in mind we introduced the concept of the circle: the wine vases are positioned in a circle around the point the grapes drop, to minimise the distance they are transported and to avoid using pumps or machinery to move it around. In line with the holistic approach that permeates the company philosophy, a lot of space is dedicated to contemporary art and music at the vineyard. How important is artistic research and cultural promotion in constructing and promoting a company identity? Bringing art into the environments where we live and work was first and foremost a personal choice, as it pleases me and my wife, but it is also a way of identifying the company and the people that work here. In particular my own personality: my holistic approach, my ideas of sustainability, my love for art, they are themes that echo through the company and messages that are conveyed outwards. In the 1980’s, with a few others here in Alto Adige, we opted for the direction of quality, reducing output and increasing the value of the product. This helped us create a strong image, marking us really stand out from the other producers in the area. Then, in the 90’s, others began to catch on to the idea of quality, and the perception of our profile became a little diluted by the crowds. So I asked myself how we could distinguish ourselves from the competition, given that quality was no longer the only factor that made the difference: that was the moment I had the idea of giving the company a clear and distinguished identity through art. Wine tasting and concerts at Vineria Paradeis and Cason Hirschprunn: guided tours of the vinification cellar and vineyards. How important is it today to welcome the customer in? Our objective is to bring as many people as possible here to Magrè, giving them the opportunity to experience and get to know our vineyard first hand. The Vineria Paradeis is where we greet customers and guests from all over the world and is a vital tool that I dedicate time to every day. In recent years we have been trying to improve what we offer in terms of hospitality, offering not just the opportunity to visit the cellars, but also the vineyards where we can actually show guests the concepts of biodynamics, and the park, which is an integral part of the holistic vision of the company. A cornerstone of the company philosophy is that a wine is an ambassador of its place of origin, and that every single vineyard has its own unique characteristics. Is it possible to communicate the differences of the various terroirs via a bottle? It isn’t easy, but communicating our individuality through the bottle and its packaging is a crucial point and something I’ve always personally overseen. And in our partner, we have found an extremely attentive and intuitive interlocutor, who first of all set out to understand what we wanted. Due to the great diversity of pedoclimatic conditions we have in the various regions of Alto Adige, we have a vast assortment of varieties, and therefore it is complicated to try to communicate all their idiosyncrasies in the right way. Today I’m very happy with the presentation of the company, precisely because with our partners he have managed to create very distinct labels, each very different to the others; we also greatly an enjoyed initiative we undertook ten years ago now, in which we worked with artists who created the labels of the Monovitigni line for us. Therefore I believe that through these labels, if a consumer takes the bottle in their hand, he can see much and understand our philosophy, the way we work. And we’ve come to the last question: as we’ve said, your production is particularly rich and diverse in typology and positioning. How did you resolve this complex issue? In these very days we’re yet again discussing how to divide our vast assortment clearly to distinguish the different types and qualities we have. At the top of the pyramid are the Masi wines from the Löwengang estate , Hirschprunn estate, Maso Römigberg, etc., which have been cultivated in a biodynamic way for years, based on the idea of the living organism, a theme central to the philosophy of Rudolf Steiner. To each of these wines, the most important from a qualitative perspective, we have tried to a great sense of individuality through the bottle and label, because the wine of each farm is an entity, it has its own characteristics affected by the soil, the position, the environment, the presence of animals and other plants. Then we have an intermediate level – gathered in the Terroir category – which include wines from areas with limited space, Masi, smaller regions or towns that are the maximum expression of their wine variety. Finally we have the classics, the characteristic wines of the territory, of good quality but prices to suit day to day consumption. Again, with the help and guidance of our partners in Bergamo, we have succeeded in giving each wine and line its own theme, and I think this is very important. It’s important because the consumer has to understand what product they have picked up, not just by looking at the price. They need to perceive the quality we give to every single wine.